I wanted to be on the bargaining team to be more involved with the process, grow as an educator and get out of my comfort zone! I have been an ASD teacher for 18 years and a building representative for 13 years. I have 9 years of teaching at Hanshew Middle school as a Social Studies teacher. I have also taught at William Tyson, Abbott Loop and Hanshew Middle school. I have also coached tennis, volleyball and track. I have lived in Anchorage for 34 years and have been involved with our community in many different ways. I have also worked in the private sector. I feel ASD is at a turning point. Teachers have been asked to do more and more each year. It is time for ASD educators stand up for a fair contract, be treated with respect and make a great learning environment for our students. I have an extensive teaching background having taught every grade K-8, except 1st and 7th. I was an EdTech coach for several years and have had the opportunity to work in over 20 different schools throughout the district. I also have my special education certification. I attended Gladys Wood, Mears, and Dimond. I did my internships at Bartlett and Mears and have been teaching at Service for seven years. I’m currently on the displaced list. My certificate is in Business Education and I’ve been teaching Math and Photography. I’m a Public Affairs Specialist with the Alaska Army National Guard. I’m proud to be representing all of you on my first contract as part of the AEA bargaining team. Originally from the Bay Area, I have been in Alaska for 28 years. I am a former High School English teacher and Union President. I have been a UniServ Director for the past 17 years primarily supporting AEA, although I have worked and bargained with other locals across the state. I enjoy wildlife and photography and spending time with my family on the Kenai whenever possible. I am looking forward to a successful resolution to our current bargain. I wanted to be a member of the bargaining team to advocate for teachers who are tier three like me as well as represent the unique concerns of those us us working in special education. I am a lifelong Alaskan and graduate of the Anchorage School District. My husband and I rescue animals and are foster parents to one of my former students. Corey has been working in the Anchorage School District since 1996 and started his involvement in contract negotiations in 2003. Corey has participated on all AEA bargaining teams since then and has extensive knowledge of the process and contract language. Having worked in both a Title 1 environment and an optional program, Corey has a well rounded view of the elementary programs in ASD. Corey tries to solve problems and work with all in settling issues and finding common areas of agreement to help both members and ASD move forward in a productive fashion to promote students success. These documents are provided to help inform the discussion among members and the public regarding bargaining. 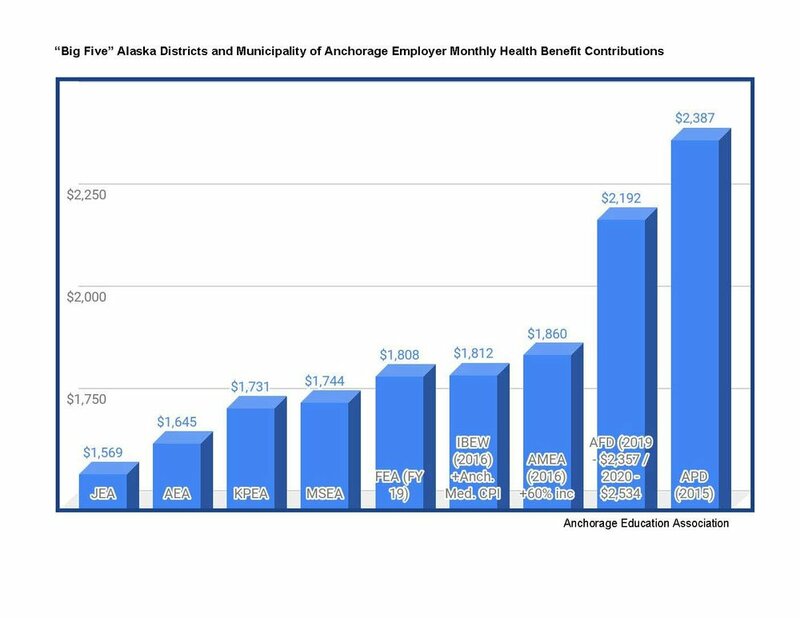 * Despite being good stewards of our health care dollars, the ASD's health benefit contribution is significantly lower than all but one of the other large Alaska school districts. * What's worse, ASD employees receive the lowest health benefit of all Municipal workers by far. IBEW members who work for the Muni received $1,812/mo in 2016, but that amount has increased both years since then (although the current dollar amount is not listed in their contract) as this benefit amount is contractually linked to inflation (Anchorage Medical CPI, not to exceed an increase of 10% per year). The Anchorage Municipal Employee Association members have a similar agreement, but rather than tie to inflation, 60% of the increases over the last two years was picked up by the Municipality. Again, APD's current agreement does not state the dollar amount, but has transitioned from a (huge) dollar amount in 2015 to a percentage over the last three years, so the Muni now covers 90% of their premium (compared to the 82% of the Plan C premium covered by ASD.) Anchorage fire fighters will receive $2,534/mo. by 2020 - roughly $900 per month more than ASD educators do now!!! This represents a gross inequity among public employees in Anchorage, since the ASD operates as a function of the Municipality of Anchorage. * This graph demonstrates the relationship between actual salary schedule increases and the corresponding Anchorage annual inflation rates. The fact is that educator salaries have been stagnant over the last decade in real terms. The CAEPR study cited above stated that Anchorage educators were 10% underpaid in 2015 and there has already been about 3% inflation since then. * One of the two most important factors in student success is having a highly qualified, well trained, dynamic professional educator in each classroom (the other being class size, of course.) Unfortunately, the district is failing to attract and retain enough educators or limit class size. This is resulting in higher recruitment costs and lower student achievement in ASD. * Given the national teacher shortage and increasing mobility of employees in the United States, it is no longer sufficient to only compare to other Alaskan districts, as all districts in the country are competing with each other for employees. Many districts in our closest neighboring state, Washington, have recently been offering substantial compensation increases. There are many Washington districts who have higher salaries than those included in these graphs and/or given higher percentage increases. 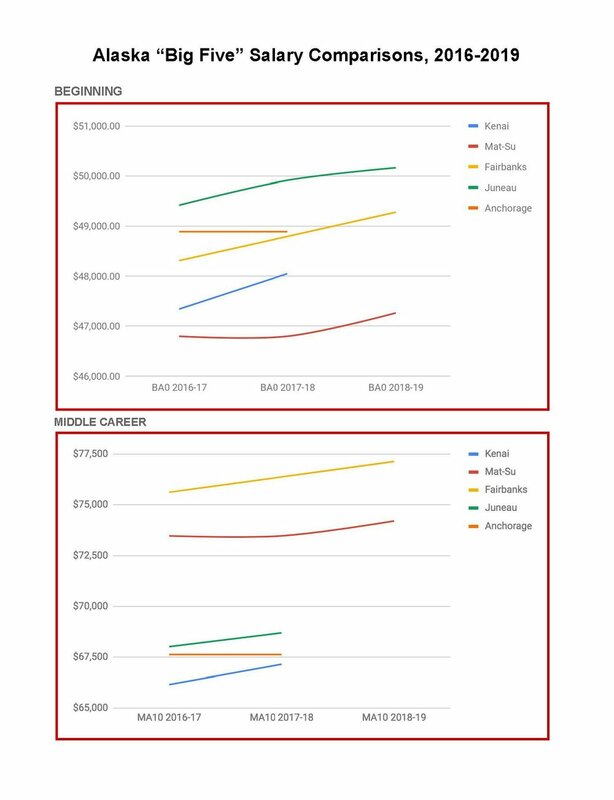 However, these were highlighted because they are in communities with a cost of living comparable to or lower than that of Anchorage - and yet higher salaries overall. 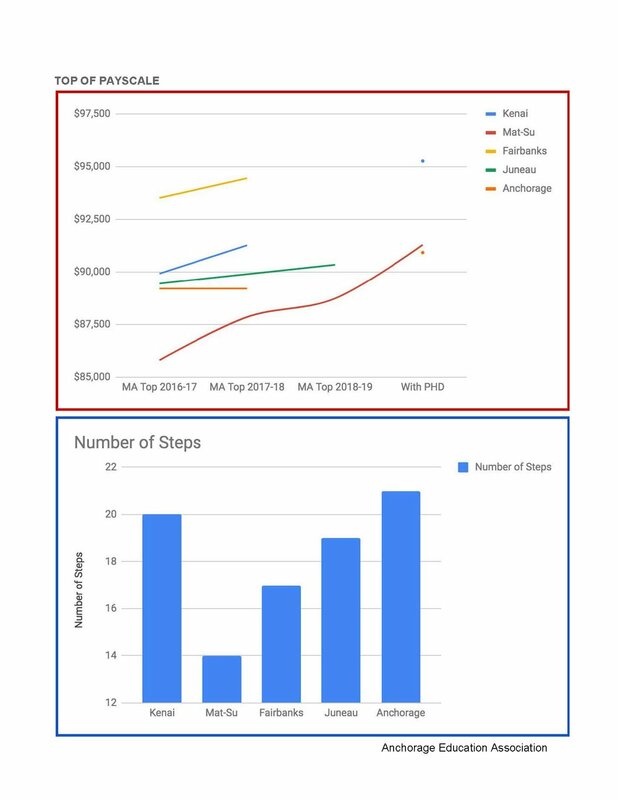 (And while not shown here, only one has a pay scale with more steps than ASD's.) Coupled with a defined benefit retirement system, Washington and other states are becoming more and more attractive places for educators to work and live relative to Anchorage - a fact that ASD will have to address. * The far right columns show the two Health Trust plans offered to AEA Members. We pay the composite rate below, but note that despite the benefits being much better than the three examples on the left, the tiered rates for our plans are still less expensive than both Sitka and Galena districts, who are not members of the Trust.